The Micro Amp is a tiny guitar amp that hooks up to your iPhone or iPad via USB. This lets you either record your playing into something like GarageBand, or run your guitar through any effects app, before returning the effected audio back to the speaker. The old iLoud does the same thing, but it connects using the iPad or iPhone’s audio jack, making it a) obsolete for newer iDevices and b) much poorer quality than a digital connection. The Micro Amp doesn’t have to be connected to an iPhone or iPad, though. You can plug in and play using it by itself — just you, the Micro Amp and your guitar. 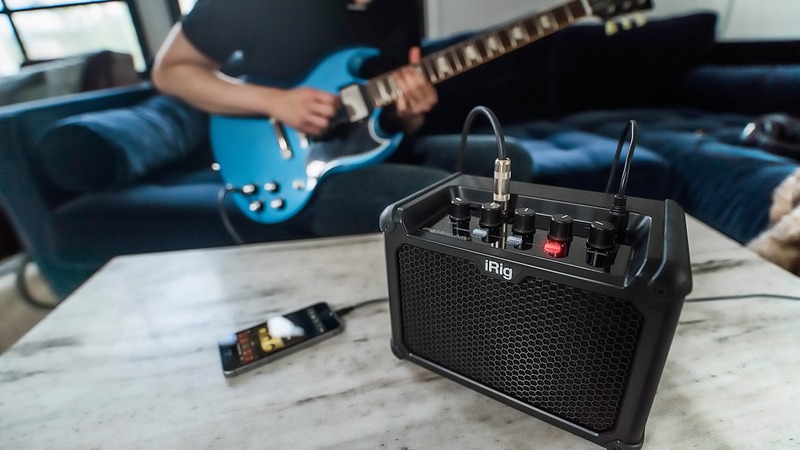 To this end, the iRig Micro Amp offers three channels: clean, drive and lead (for various levels of dirty distortion in the sound). You can also plug any audio player straight in using the aux input, to use the Micro Amp as a plain music speaker or to jam along to backing tracks. Finally, there’s a speaker-out socket for hooking up the new iRig amp to a bigger speaker cabinet. The Micro Amp runs off the mains, but can also take power from a bank of six AA batteries. When plugged in, the output is a demeaning 15 watts. On battery power, you get half that. IK usually manages to get very big sounds out of very small speakers, though, so hopefully that’s the case here. All in all, it’s a pretty handy device. It’s certainly perfect for a traveling guitarist, and might even be up to some light busking work. And at $150, the price is right.